Android is loved for its great customization capability. It allows users to change the interface, the text messenger, file manager, icon packs and lock screen apps. Whatever you call. You get an option to customise it according to your will. Customization lets to creative and attractive user interface. Even if you are using same smartphone from ages, you can totally revamp its look and feel by using some apps. Each day, new creative developers come up with something great, there are different platforms in Android where you can explore your creativity. Today we will talk about Top 5 keyboard apps for Android phones. These days you don’t even have to root your device to access great customization features. Everything is present in Google play store, you just have to download from there and use it on your phone. Changing keyboard is a common thing for the people who text a lot. They like trying out new things, or may be they get bored of stock keyboard on Android. Although 3rd party keyboard apps were introduced recently in Apple devices, but for Android it’s been available from long time. Fleksy is said to offer best prediction of words among the other keyboards. It has a different style of swipe and it allows you to use gesture typing that can help you type at great speed. It has to offer 40 different themes and it also has customizable font size. It also offers GIF support, which is quite great. 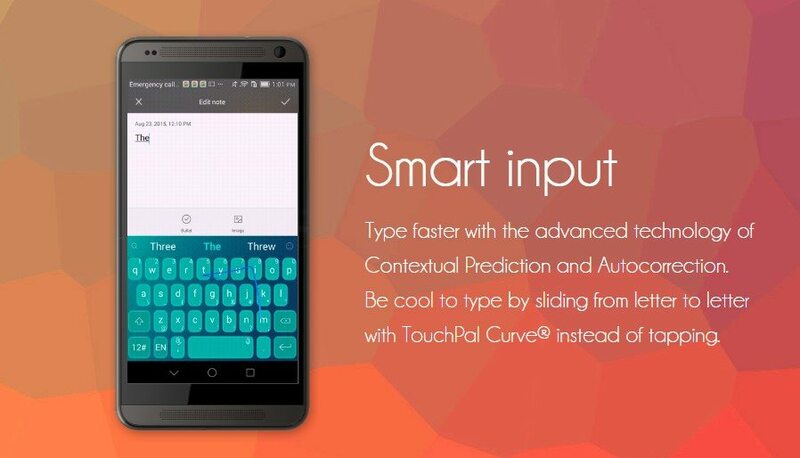 Although touchpal is not much known among Android users, but it has some great features that makes it different from others. It allows you to delete a word by just swiping from backspace and it shows emoji drawer as you swipe up from the space bar. Emoji drawer also has emoji art and emoticons. It is one of the most unique keyboard ever. It has minimalistic design and you can convert it from standard keyboard to mini mode that makes the size of keyboard to about half inch. You can try it out for free and use it for 30 days on trial then after 30 days, if you want it for the rest of your life then you will have to pay $3.99 price. Although it’s paid and a new keyboard, but it has been giving tough competition to the other keyboard apps since its release. It gives you option to resize keyboard, enable night mode and change the colour of your keyboard. It also offers swipe typing and you can choose from the sixty different languages available. The look is same as of stock keyboard but the features are great. Before 2014 SwiftKey was a paid app. In those days no keyboard ever came close to the speed and prediction accuracy of Swiftkey. I guess back in the days, Swiftkey made enough money to be free for the rest of its life. It is bloat free and great app for everyday use. It comes preinstalled in some Android phones. It still stands as one of the best Android keyboard ever developed and for us it has made it to the top 5 keyboard apps for android even in 2016. Best Alternate for Google Messenger App. Top Lock Screen Replacement Apps. Top 5 Unique and Modern Icon Packs. Top 5 File Manager Apps. That’s all from my side on top 5 keyboard apps for android. If you think some other app should be in this list, feel free to suggest in the comments. Also give us feedback regarding which keyboard you are using on your phone and why you are using it. Try the apps above, if you are tired of your stock keyboard app on Android phone.